A ListBox has a huge number of methods and properties. In our straightforward Lazarus demonstration we show you how to add an item to the list and to remove an item from it. If you add several items you may want to save the new version of the list, so we use the convenient SaveToFile and LoadFromFile methods. We added to the form a ListBox, Edit and four buttons (from the Standard tab). In the Object Inspector we set the Sorted property of the ListBox to true and clicked on the ellipsis button for the Items property to obtain the Strings Editor Dialog. We typed in the items and sorted them. The ItemIndex property equals the zero-based number of the selected item in the list and equals -1 if no item is selected. Our code of the files needed for program ListBoxDemo follows. You can copy the code if necessary, but a you should be able to adapt it for your own use by inspecting the code. 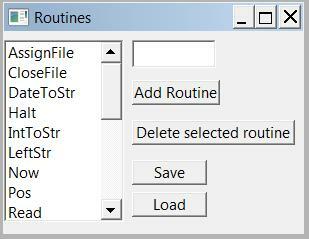 (Delphi 7 has a useful DeleteSelected method for a ListBox).